Whistler and the Sea To Sky area. Contact me if you are outside of the area and I will try to help you to the best of my ability. I work on a reward basis. Whatever you think is fair. However there is a call out fee of $25 if the item is NOT found. This covers the cost of my fuel to get there. If you are outside the area contact me and we can work something out. 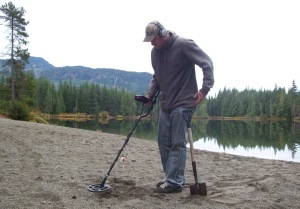 I have several years experience metal detecting and have a passion for finding what was thought to be lost forever. The sooner you call the better chance you have of getting it back. I use professional equipment and will try my very best to find your lost item. Thank you Justin !!!!!!!! There isn’t a day that goes by that I don’t think obout our success in finding my ring. If I didn’t take a chance and find you through your web site I would be thinking about how I gave up to easy . The monetary value was erelivant but the sentimental value is Eriplaceable . I thought that finding my ring was worse than finding a needle in a hay stack . There was approxamently 15,000 people there over the weekend. The fact that nobody found the ring astonishes me. another thing that really impressed me was how fast Justin responded to my email. it was a matter of minutes. Justin literally dropped everything that he was doing and came out to Whistler from Squamish . even after being turned away by security that night Justin was willing to come back the next day. The trip from Squamish to Whistler takes over an hour . the crazy thing was after we got back up to the spot where I lost my ring it only took a few minutes for him to find it. I’ve worked with metal detectors before and seeing Justin’s success in such a short time is remarkable. A big thank you to Justin once again I would recommend him for anybody that lost any valuables. 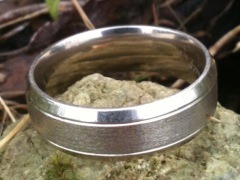 Thanks a billion times again for finding my wedding ring today! I still cant believe that it is back on my finger after spending a night in the Callaghan powder. 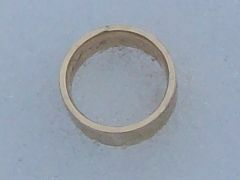 The ring is priceless to me and my wife, and fortunately I’m out of the doghouse! I would also like to thank you for such a quick response to my problem as you were on site within an hour. Not sure what I would have done otherwise. Keep up the awesome and priceless service you provide!